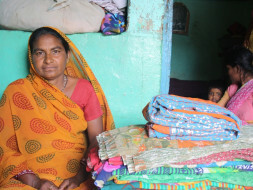 Strong, independent Baluben from Chandkheda village in Gujarat, transformed her decade-old sari business by significantly increasing her profits with a loan from Milaap. When her husband left her in adverse conditions, Baluben took charge of her life and decided she needed to expand her business. With her Milaap loan, she bought better quality saris and bumped up the size of her inventory. Instead of selling 2 to 3 saris a day, she progressed to selling 12 to 15 saris, of better quality and for higher prices, netting around Rs.10,000 a month instead of the Rs.2,300 she made earlier. Next, she plans to add artificial jewelry to her inventory. Rural Gujarat is dotted with similar success stories, and with women who are eager to establish a stable livelihood so they can provide better lives for their children. Milaap’s field partner in the region – Prayas, empowers these women from socio-economically backward families, supporting them with credit facilities, training, and driving awareness of their rights and duties. It helps build community-based organizations that promote long-term sustainability of these women’s efforts.